Fáilte Ireland has named The Burren Food Trail as one of four Irish finalists of this year’s EDEN (European Destination of Excellence) competition with Tourism and Local Gastronomy as the theme. 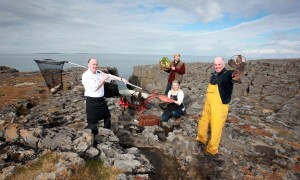 Launched by the Burren & Cliffs of Moher Geopark and the Burren Ecotourism Network as the Mid West’s first food trail in 2013, the Burren Food Trail is supported by an innovative schedule of food events taking place every Monday from May to October. The events showcase the regions excellent cuisine and provide a unique food experience in the amazing landscape that is the Burren. Members of the Food Trail place an emphasis on the use of local ingredients and are committed to building a sustainable future for the region through food. The other three EDEN Irish finalists are Wild Atlantic Way So Sligo Food Trail, Cong Food Village and West Waterford. A panel of expert adjudicators will visit each of the locations on Monday 11th May ahead of the naming of the overall winner on 22 May 2015. Held every two years, EDEN focuses on a different aspect of tourism each time with the winning destination to receive a promotional photo shoot to market itself as well as €5,000 towards highlighting its attractions. The winning entry will also represent Ireland at a ceremony/exhibition in Brussels later this year. “The objective of the Burren Food Trail is to enable visitors to mentally and physically link the food to the spectacular landscape within which it is enjoyed. It seeks to capitalise on our USP, the landscape itself, and tell the story of how it has influenced farming, fishing and food flavours, and has inspired a collection of award-winning food producers and restaurants to congregate in the area. “Each festival, event and publication seeks to easily uncover the path from farm to fork, showcasing a destination where producers, growers, suppliers, chefs and shops are working in tangible partnership. Our vision is to create a solid relationship in the mind of the visitor between high quality, sustainable food and the karst limestone landscape, making the Burren the most intriguing food story and food destination on the Wild Atlantic Way,” added Ms. O’Dwyer. Commenting on the EDEN competition, John Mulcahy, Fáilte Ireland’s Head of Hospitality, said: “We are delighted to announce the four Irish finalists shortlisted in this year’s EDEN competition. Each of these applicants has clearly demonstrated that their local gastronomy has taken a clear role in their tourism offering while concurrently sustaining their local environment. “Ireland has long been recognised for the beauty of its landscape and seascapes in addition to the warmth of its people. But in recent years, both domestic and international visitors are coming for our food and drink too. Our clean seas and rich fertile soil result in having the best raw ingredients that are of critical importance to Ireland’s attractiveness to our visitors. “As food tourism grows in popularity it is truly heart-warming to see so many regions placing their local gastronomy at the centre of the visitor experience. I would like to congratulate them for being shortlisted in a competition which is sure to boost the profile of their region as a destination,” he said.